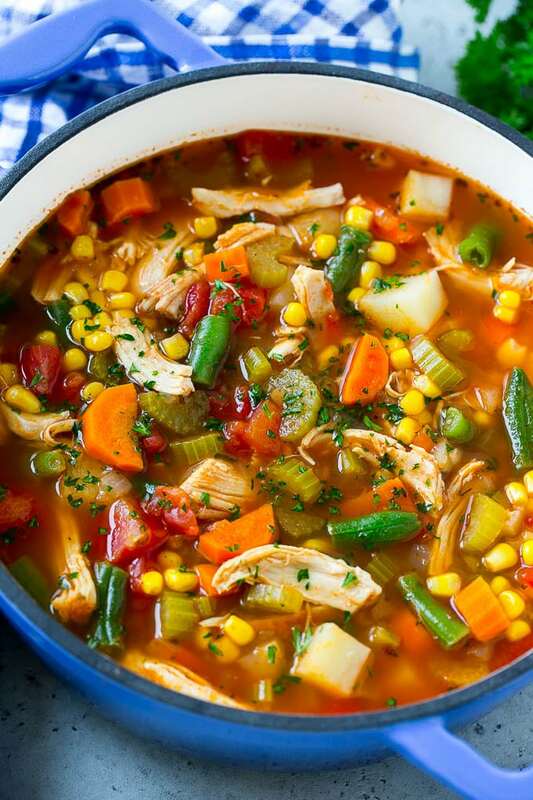 This chicken vegetable soup is full of shredded chicken, vegetables and potatoes, all in a savory tomato broth. An easy and healthy dinner option that the whole family will love! 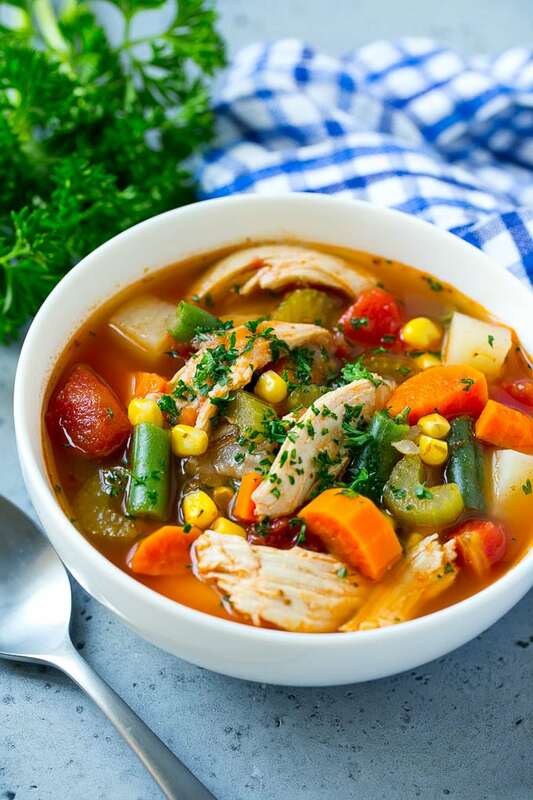 Soup is my kids’ favorite way to eat their veggies, and this chicken vegetable soup is a colorful mix of nutritious ingredients that happen to taste amazing together. Serve your soup with a side of cornbread or garlic knots for a complete meal. Soup is one of my favorite things to make for dinner, especially on a cold day. 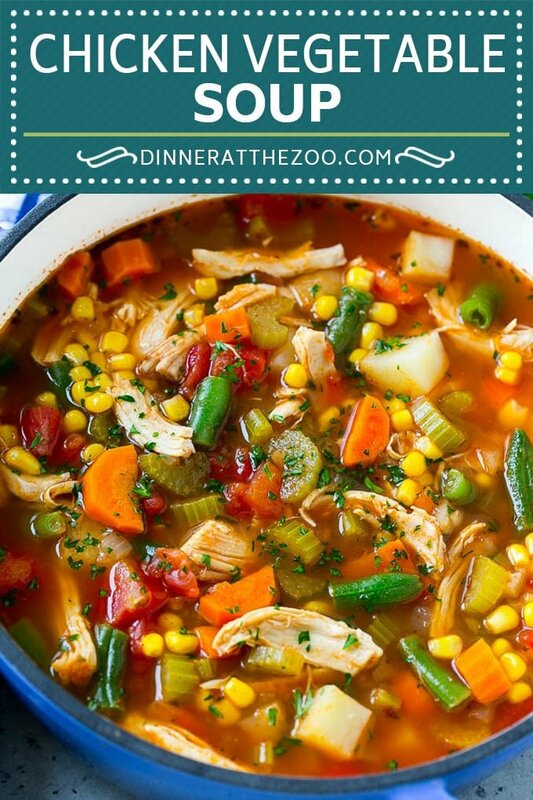 My girls happen to love soup too, and this chicken vegetable soup is a current favorite. It’s chock full of tender chicken and a rainbow of veggies for a simple yet satisfying dinner. 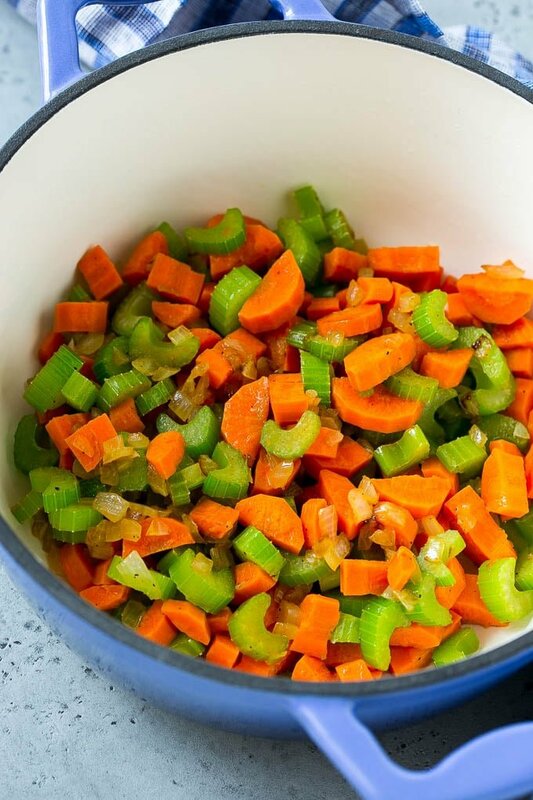 This soup starts with the classic base of onions, carrots and celery. You can use any type of cooked chicken here such as roasted cubed chicken, shredded rotisserie chicken or leftover chicken. The veggies are sauteed in a little butter, and then more ingredients go into the mix including the chicken, tomatoes, and potatoes. The soup should simmer until the potatoes are tender, and then you can stir in the last of the veggies which include corn and green beans. Add a little parsley and dinner is served! What vegetables do you put in a chicken soup? 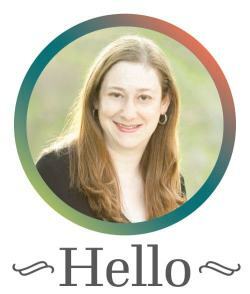 What seasonings go in vegetable soup? I season this soup with garlic, Italian seasoning, salt and pepper. Don’t have Italians seasoning? Use equal parts of dried parsley, oregano and basil to make your own. 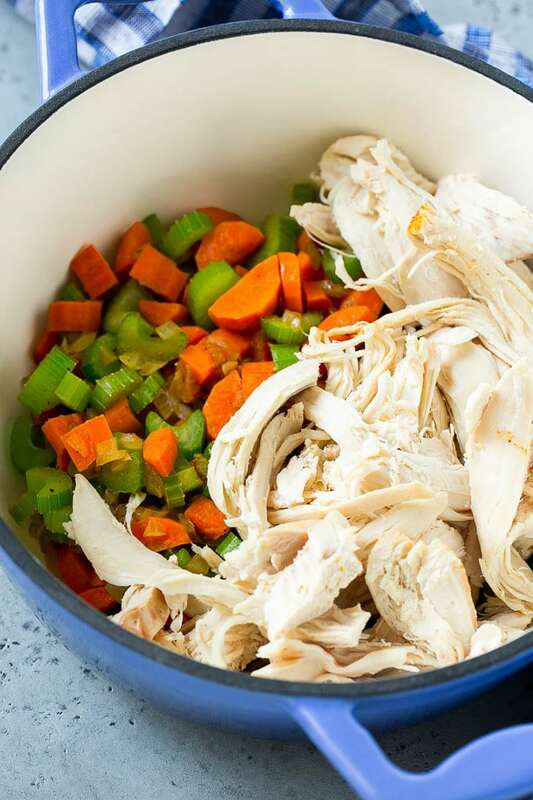 How do you make slow cooker chicken soup? You can easily adapt this recipe for the slow cooker. Simply combine all the ingredients except for the parsley in a crock pot and cook on LOW for 2-4 hours or until the potatoes are tender. Sprinkle with parsley and serve. This chicken vegetable soup makes a good candidate for the freezer. Just be aware, when you thaw the soup some of the vegetables and potatoes may be softer, but the flavor is still delicious. 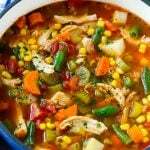 Chicken vegetable soup is on my table almost every week during the colder months. It’s super filling and I love that it’s really a complete meal in one pot. Best of all, it helps my kids to get their veggies in! Melt the butter in a large pot over medium high heat. Add the onion, carrots and celery to the pot. Cook for 5-6 minutes or until softened. Add the garlic and cook for 30 seconds more. Season with salt and pepper to taste. 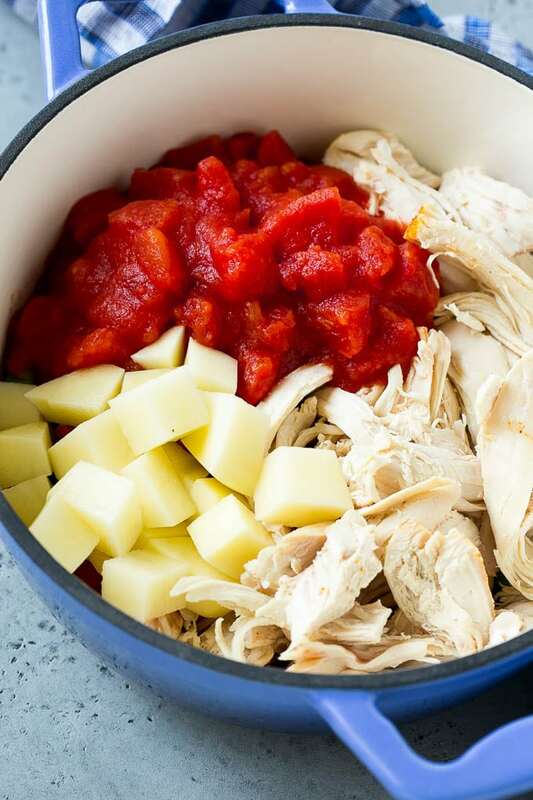 Add the chicken, tomatoes, tomato sauce, Italian seasoning, chicken broth and potato to the pot; bring to a simmer. Cook for 20-25 minutes or until potatoes are tender. Taste and add salt and pepper as desired.